Bill Van Loo says PLTW has been a great experience this year. Photos by Jo Mathis. Time after time, A2STEAM at Northside parents have told Bill Van Loo they wish project-based education had been around when they were kids. While different styles of teaching work best for different types of learners, Van Loo says he would have benefitted from more hands-on projects as a student himself. “I define myself as a maker and teacher and musician and photographer,” says Van Loo, a technology/engineering teacher who co-teaches Project Lead The Way modules at A2STEAM along with each grade level teacher. “Rather than it being something where those core things that define me were really embraced and celebrated and expanded upon throughout school, I went through a traditional, direct-instruction kind of school model. And then I had to wait to later in life to figure out what those things were and pursue them on my own. AAPS parents across the district have asked for the expansion of project-based science, technology, engineering, arts and math (STEAM) programs. Project Lead the Way is currently available at Skyline and Huron high schools, and at A2STEAM, a K-8 school that opened this school year that integrates science, technology, engineering, arts and math through project-based learning. Next fall, six additional AAPS elementary schools— Abbot, Bryant, Dicken, Eberwhite, Pattengill, and Thurston—will feature PLTW programs. The district has secured grant funding for the professional development of the PLTW lead teacher in each building and will use the technology bond to acquire the necessary devices for curricular delivery, explains Merri Lynn Colligan, who directs the district’s instructional technology and information services. 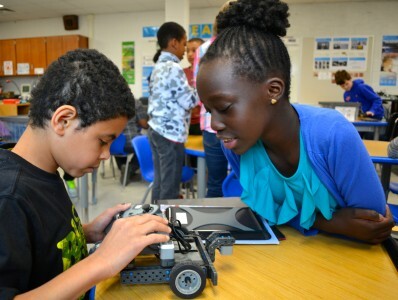 “The expansion of Project Lead the Way Launch Program into six elementary schools at every grade level is a large step forward in ensuring our AAPS students have exposure to the foundational STEAM skills including problem solving, design thinking, and creativity beginning in kindergarten,” says Colligan. Students enjoy the robotics module. This expansion of project-based learning helps prepare students for the real world, says Steve Teeri. Teeri, a maker tech at Ann Arbor District Library, is on the STEAM committee for the AAPS Educational Foundation. Van Loo says Project Lead the Way has been a wonderful experience this year. “So it’s very exciting to see that piece being brought into those other schools, as well, because it’s a nice injection of a different way of teaching those concepts and doing some project-based learning,” he says. 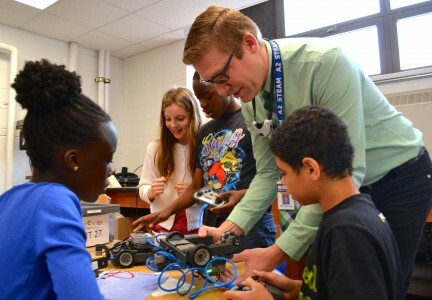 Through activity, project, and problem-based curriculum, PLTW gives students a chance to apply what they know, identify problems, find solutions, and lead their own learning. Each PLTW module is held every day for two or three weeks, and with each module, there are a couple of activities that build skills and knowledge. The content is strongly connected to the Next Generation Science Standards, and students take some of that knowledge and create a project with it before finally solving a design problem. “So there’s a really nice progression from learning some basic information to doing a project to having to solve some kind of design problem with that information,” says Van Loo. The A2STEAM kindergarteners, for instance, recently completed a module in forces—pushes and pulls. They learned the word “collision” and set up blocks like dominos to explore what happens when two things collide. First graders, meanwhile, learned how sound is transmitted, and decided to build instruments as an extension of that project. And fourth graders just finished the conversion of energy module, in which they learned about how food contains chemical energy, which their bodies transform into mechanical energy. An A2STEAM fifth grader named Sarah said that she used to attend a school in East Lansing. Thanks to funding from the AAPS Educational Foundation, next fall all district middle and high schools will introduce PLTW. A story next week in the AAPS District News will give details. I’m very excited for the expansion of PLTW throughout our district! Let’s please ensure the teachers in these schools receive at least the same amount of professional development as STEAM teachers have so this initiative is successful!